We hear the stories of the dreaming…The Rainbow Serpent sliding across the country formed the valleys and the hills with each change of direction. 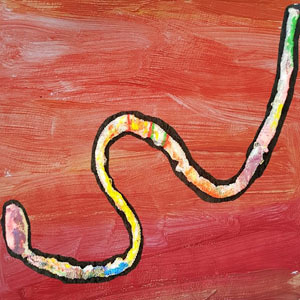 Just as the creation stories gift us with Aboriginal and Torres Strait Islanders’ culture and knowledge, the educational project of Reggio Emilia invites us to form new educational landscapes as we reimagine education within the Northern Territory. It provokes us to see the world differently and to open ourselves up to different ways of knowing and being. It is said that you can tell where a person comes from in the NT by the shade of red that is on the soles of their feet. As the varying shades of red dirt indicates a sense of place within the NT, we acknowledge the cultural diversity of the Territory and welcome the understandings each of us have based upon our own cultural lens. Inspired by the educational project of Reggio Emilia, the Top End Early Years REsearch Network reflects on how we can apply the principles of the project within our own cultural context and informs our pedagogical practices as we work and learn alongside the children of the NT.